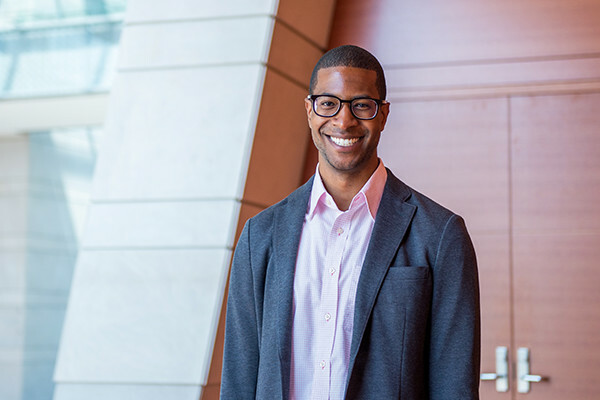 Northwestern University psychologist Mesmin Destin, whose research emphasizes the key role socioeconomic status plays in the study of human behavior, was recognized by the American Psychological Association (APA) for his stellar work in the early stages of his career. Destin received the prestigious honor, the 2019 Distinguished Scientific Award for Early Career Contribution to Psychology, for studying and developing supports that help middle and high schoolers from low-income backgrounds -- as well as first-generation college students – tackle obstacles and inequities in education. An associate professor of human development and social policy and of psychology, and a fellow of Northwestern’s Institute for Policy Research, Destin has made his mark studying how environments shape identities and how this impacts a student’s motivation, behavior, and trajectory in life. His work suggests that college students who are the first in their family to attend can suffer academically and psychologically on campus, surrounded by “continuing-generation” peers and faculty who often don’t understand their situation. But by paying attention to psychological factors, both individuals and institutions can help set students on a path to success. Encouraging positive interactions with faculty, for example, can help low-income students, especially women, to effectively pursue their goals, Destin’s research suggests. "How we frame our mindset going into the interaction helps ease the anxiety and lead toward more confidence in non-verbal interactions," Destin told the Pacific Standard. The APA award honors early career scientists for their contributions during the first nine years after receiving a doctorate. As an undergraduate at Northwestern, Destin began studying how socioeconomic status shapes behavior and school performance. He earned his doctorate in social psychology at the University of Michigan and returned home to Northwestern where he began looking at the social experience of first-generation college students at elite institutions. In one line of research, Destin has found that community can combat general feelings of isolation as well as help students perform better in college and beyond. His works suggests that helping students express their identities and sense of purpose boosts academic achievement, career motivation, and resilience, even in the face of tremendous challenge and adversity. This core finding is the foundation for several programs at Northwestern, including the SESP Leadership Institute, which he co-leads with Shirin Vossoughi, assistant professor of learning sciences. “If students have a sense of where they’re going and why school is a part of it, there’s more meaning in difficult school tasks,” Destin said. For example, telling a student that “doing well in high school helps you get into college, which helps you get a better job,” rather than “You go to high school because it’s the law,” can make their daily work more meaningful and improve performance. Northwestern’s Compass Peer Mentor Program, which pairs first-year mentees with upper-level mentors, also puts Destin’s research into action. All participants are first-generation and/or low-income college students and Destin’s work on language and messaging is a fundamental part of the program. Destin is currently studying the impact of Compass, and results thus far are very promising. Most recently, Destin reviewed the body literature looking at how systematically incorporating psychological factors – such as encouraging growth mindsets, linking classroom work to real-world goals, and using only modules that help trigger students’ motivation and sense of belonging – can help students reach their academic goals. Financial aid alone can help students afford college, he says, but financial aid accompanied by financial aid counseling can inspire students to plot a path to succeed in college and reach financial security. “As psychological science continues to uncover more of the factors that help students reach their goals, it can also be used to rethink the systems that surround students,” Destin wrote in a Psychology Today essay. “In addition to thinking about teacher supports and development, similar approaches may be effective by focusing on other levels like peers, parents, neighborhoods, and overall school climates."